The word 'sinecure' comes from the Latin sine, which means without, and cura, which means care. A sinecure is an office or position requiring little or no work but giving the holder status or financial benefit. Leinster House is full of them and Leinster rugby picked a few sinecurists to play against Connacht last Saturday in the Sportsground. It takes a lot of effort to be that bad . . . 47-10; fulfilling a fixture and losing is one thing, getting humiliated is another. Everybody seems blasé about the whole episode so maybe I should just run with the pack on this one. There were, though, 11 players who will travel in the 23 to Bilbao who partook in this slippery chapter so how do we put it back to factory settings and erase history? There is an upstairs/downstairs mode to Leinster's roster - a shadow team that wears the blazer, struts around town and participates in sound-bite journalism about how ambitious they are and the lack of opportunities because of the quality ahead of them in Leinster. Nearly all the 23 places for Bilbao are set in stone, but one rolled ankle and suddenly a replacement is required. After that performance in the Sportsground none of the dirty dozen have a chance of being picked. In fact, if Ross Byrne or Joey Carbery are to go to Ulster, the deal should be that they take at least half-a-dozen sinecurists with them. Leinster's road to the final after they won their pool has been an easy ride - no spurs, no whip, no inquiry from the stewards' club. Leinster are strolling along to the big event. I suspect that Mark McCafferty and his acolytes are steaming. Once again the Irish Pro14 sides can rest their senior players whenever they want. Leinster had already qualified for the Pro14 semi-final as top seed with home advantage, so why risk their starters? In direct contrast, Racing have had to put out their number one side to face Toulon and then Toulouse in April to ensure that they stay in the play-offs. Those two teams are a point and two points behind Racing, who are in second place with a guaranteed home semi-final if they manage to stay there. A win yesterday against Agen at home and they will be guaranteed that. However, they had to pick their number one side for the fifth match in a row. As a result they lost their most valuable player, Maxime Machenaud . . . they have lost their Johnny Sexton! As a disciple of the value of rest, I can't really complain. Racing have no choice and had to keep their boots in the stirrups as they disposed of Begles-Bordeaux 15-39 last week. Christian Labit, Racing's uncompromising head coach, probably prefers his players to keep going. Machenaud's loss was a serious blow but they managed to win the Bouclier the season before last against Toulon when Machenaud was red-carded early in the first half - no mean achievement. Racing in recent seasons have hit their best form in April and May. They may be tired but they have momentum and they are winning. Maybe we could paraphrase Gordon Gekko here: "Rest is for wimps." Since Leinster beat Montpellier 23-14 in the Altrad Stadium in January in their last pool game (an impressive feat) the first-choice team has only really played twice and those matches were the quarter-final and semi-final, which were both in April. Leinster were very impressive in both engagements; sharp, composed, cold-blooded and prescient. The missing 10 weeks they were all playing for Ireland which is good for everyone. It will have been eight weeks since they trained under Joe Schmidt and you would hope that the fear and discipline which he instils remains long enough in the system. Norman Schwarzkopf, the US supreme leader in the Gulf War, complained about life when he left the military. "Seven months ago I would give a single command and 541,000 people would immediately obey it. Today I can't get a plumber to come to my house." Leo Cullen and Stuart Lancaster have received the plaudits for the way they have guided Leinster this season. The blue side have been ruthless in the big games and they have looked invincible this season but they have chinks in their armour and the run-in will go a long way to see how the pair of them have progressed. Lancaster coached England to four consecutive runner-up positions when it seemed easier to win the Grand Slam or the Championship. Lancaster has not won a major championship as a senior coach yet, and last year's failures in semi-finals with Leinster was a draining and chastening experience. Saturday's final is a major test for the Englishman. His structures and codes have given Leinster direction. He is highly thought of and it is impossible to underestimate his influence on the team as he calibrates the way they perform. This match is not about anything else other than winning. As Peter O'Mahony very succinctly stated after losing to Racing, "I'm sick and tired of learning." Whatever else they do and whichever way they do it, Lancaster and Cullen have to deliver a win for Leinster. They may if they win attribute it, and dedicate it, to the players or the fans but deep down inside there has to be an element of selfishness in what they do. A win for the pair of them would do wonders for their own self-esteem and sense of worth and it would undoubtedly elevate them to another level. Salvation and rehabilitation for Lancaster; special status for Cullen who is already a spectacularly successful player in terms of silverware. A cup win here gives Cullen longevity in his position at Leinster and puts him into a category where it is conceivable that he could take a step further up the ladder. Cullen's ability as a player was undoubted but this would underpin his coaching credentials. As it often is in major finals, the best-coached team normally carries the day. Cullen and Lancaster were in command in the Sportsground. Whatever way the game-plan was conveyed to the shadow squad, it got lost in translation. The half-time chat? Find me a plumber! I fancy Leinster strongly. I think if they click they could tear Racing to pieces. The flip-side is that over the last two seasons Racing have developed a strategy of starting every game very strongly. They did so against Munster. Leinster got caught cold more from their ineptitude than Clermont's brilliance in last year's semi-final. They retrieved the situation but let it go again and a situation where they could easily have taken Clermont was gone and as the weeks went by this became more and more evident. 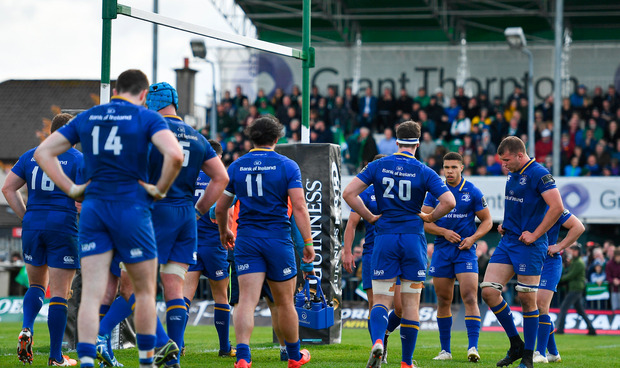 The Leinster players, thinking out loud, that they would have loved a crack at Saracens. The corollary of that point being that they all thought that they should have won the semi-final. The power of subconscious thought! Christian Labit is a very good coach. He will find weakness in Leinster's make-up and his team have the ability to start like a TGV. Defensively, Racing are one of the strongest sides in Europe. Don't kid yourself by thinking that they had to work too hard to repulse Munster's predictable and pretty feeble second-half efforts - the point is they can defend. Labit knows that Leinster are fitter, much fitter, and will probably win the game in the last quarter, if not before. If his team get a good underdog's start and unsettle Leinster, who have been out of serious combat for a while, and Leinster's management struggle to respond, well then we have a game on our hands! At all stages the winning and losing of this cup is down to Cullen and Lancaster. If they prime their team properly they will be champions.